Use Multitasking in iOS makes the iDevice more powerful. Because it’s bundle features like Drag & Drop, Split View or Split screen & Slide Over, Multitasking apps on Dock, Most recently used apps on the dock and more trustworthy and important for products that we never used in past. here’s I explain closer look into all the features one by one with the video tutorial. 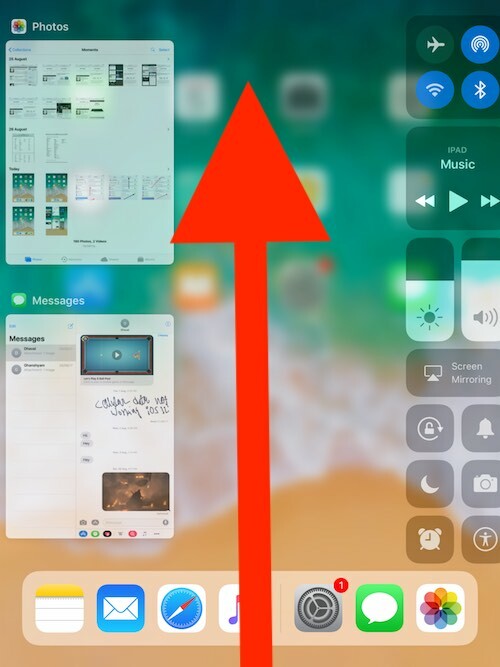 For using the multi tasking you have to swipe up to the center of the screen, then it will show up the iPad’s new App switcher which is a mixture of the Mac’s Mission control interface will help you in the multiple tasking. Let’s see how to use Multitasking on iPad. This feature is in the widget option to the right side of the screen, the Dock along the end of the screen or at the app spaces from them tap on the App thumbnail which tap on the along with the split view instances which goes much easier than anything in which you have to tap and hold on the any of the widget to control that and on any of the app to direct go to the full screen. To access dock on the lock screen or app screen, Swipe up finger on the iPhone screen from bottom to top. The dock will pop-over on iPad screen. A dock is a new way to open or access most recently used app on iPad in iOS. Next, Swipe up your finger and Launch dock, Open Message app from another hand. Leave photo on the Messages text box. That’s it, in the same way, we can use other essential apps like mail, Web Browser. The split view will let you enjoy more than one panel ever before and split view will allow you to swap panels more actively than ever before. The drag and drop option will help you to drag your apps, documents, photos or much more. 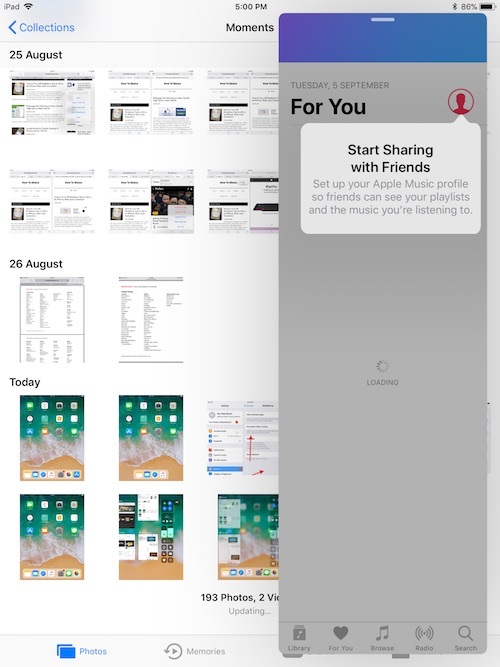 The split view of iOS generation is gone and the iOS will make the iPad user enjoy the all side by side while working together. For using the split view you have to open the app first which you are going to use and then you have to pull up the Dock and drag the app you want to use on any of the side right or left as you wish. A single Slide over the window will show up the showcasing the new app on the head of the running one but both the slide over the app and the running app able to interact together. This means you can use both the app together at any time without any interrupt and blocking. This app will show up to you in three ways: 50-50% – this means that both the apps will take half of the place of screen equally and works simultaneously. 25-75% – This means that the left-sided app will take 25% of the screen while the one on the right side will take another 75% of the screen. 75-25% – This will make the 75% usage of the screen of the left-sided app and the other will take 25% of the screen. If you are bored from the split screen then you have to simply swipe in any of the direction and off the panel. 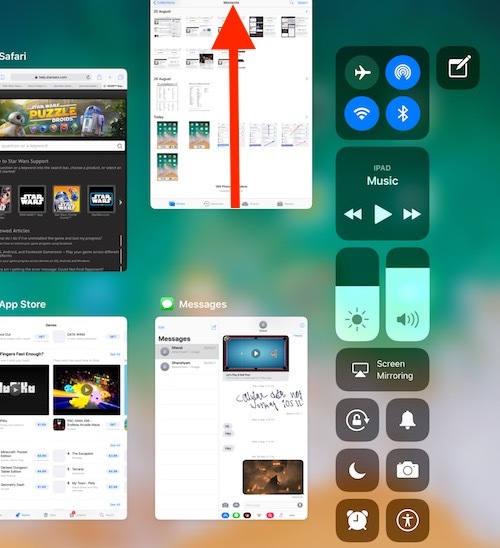 For make exit of the split view then you have to drag any of the apps to occupy the complete screen and then you have to pull down from the top of the display screen and then to access the new lock, Multitasking or notification center. You can even drag many of the apps together and for that tap on the first app and a then gentle tap on the other apps you want to drag and even choose multiple apps and enjoy them together. 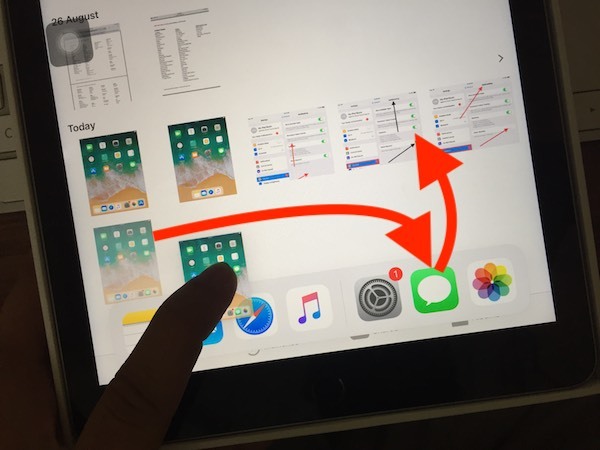 Using Home button: Double tap on the home button, To see the App Switcher screen. 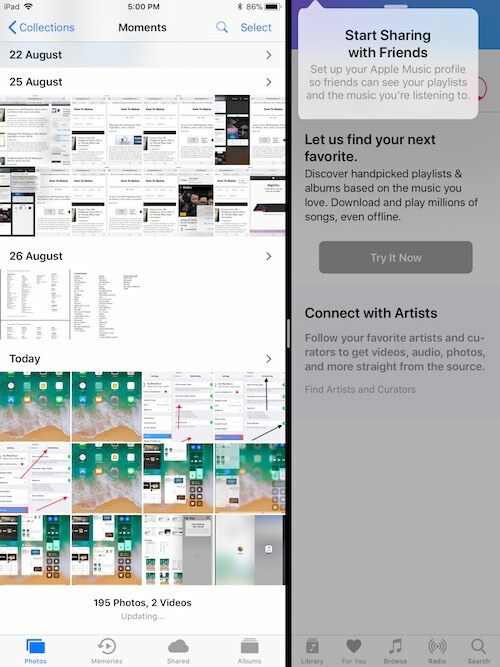 Swipe finger bottom to up and see the multitasking screen, To close the app just swipe up finger on Small app preview page. Useful: Customize Assistive Touch on iPad. Update your iPad to iOS and get ready to use Multitasking on iPad.